The main event in Book Six in the Battle of Marathon, which of course was an Athenian victory. The Spartans must have been envious that they didn’t share in the glory, and nervous that their rival city-state got all the credit. But Sparta gets its own back in Book Seven. The main event of Book Seven, of course, is the battle of Thermopylae, during which an elite force of 300 Spartans, accompanied by Thespians (fighting voluntarily) and Thebans (fighting involuntarily), hold off the mighty Persian army at a narrow coastal pass just south of Thessaly on the Greek mainland. The narrow pass at Thermopylae negated the Persian numerical advantage, but more importantly the Spartans had greater bravery and greater fighting skill, allowing them to repel wave after wave of Persian attacks. Only when the Persians discovered a way around Thermopylae were the Spartans encircled and defeated. But even knowing this, the Spartans never retreated, and died to a man. So Thermopylae represents a defeat, but a very inspiring one. Tactically the Spartans delayed the Persian advance so that other Greeks had time to dig in, so some tangible good, and not just inspiration, did come out of it. The archetypical Laconic phrase is a reply to Xerxes’s demand that the Spartans give up their weapons. 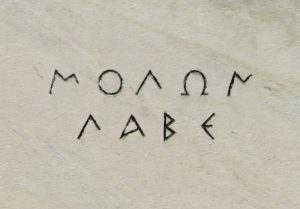 The Spartan King Leonidas replied simply with “Come and take them” (μολὼν λαβέ). Alas, this gem of a riposte does not appear in The Histories. But it does appear in Plutarch’s Moralia, and it is inscribed on the base of the statue of Leonidas that we find at Thermopylae today. This expression echoes down the ages: it has resonance in American gun culture for obvious reasons, and one sees it as a decal on cars. It’s a slightly classier way of saying “You can have my gun when you pry it from my cold, dead fingers.” The Michigan State Spartans also use it in their marketing, as though to reply to the opponent’s request to give up the football. fighting singly, they are no worse than any other people; together, they are the most gallant men on earth. For they are free – but not altogether so. They have as the despot over them Law, and they fear him much more than your men fear you. At least they do whatever he bids them do; and he bids them always the same thing: not to flee from the fight before any multitude of men whatever but to stand firm in their ranks and either conquer or die. Your advice with relation to us comes from something less than an equality of position. You counsel us as one who has tried one condition but knows nothing of the other. You know what it is to be a slave, but you have no experience of freedom, to know whether it is sweet or not. If you had had such experience, you would bid us fight for it, not with spears only, but with axes as well. It’s a nice detail that Sperthias and Bulis refuse to bow to Xerxes when they arrive in Susa. So yes, Thermopylae matters, as does the Greek conception of freedom and the rule of law. More than Marathon, Salamis, or even Plataea, Thermopylae is the battle that people remember. Of course it does help that the Greeks ultimately won, validating and justifying Thermopylae, and it helps that the Spartans inflicted huge numbers of casualties prior to their own defeat. It is true that a tactical retreat is often a better option than a noble sacrifice: In IDS 305 today, we talked about the French Order of the Star, founded in 1351 and severely weakened the next year at the Battle of Mauron, when ninety members, sworn not to turn their backs on the enemy or retreat more than four steps, consequently lost their lives, to no useful purpose. 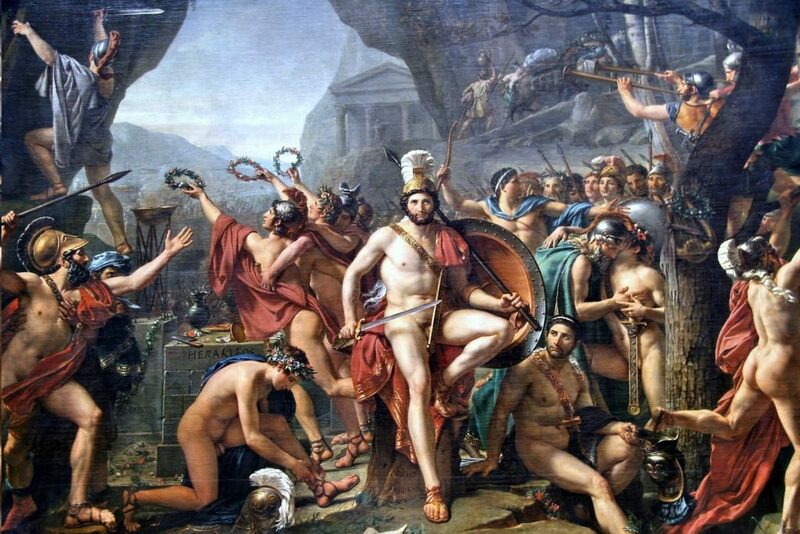 Jacques-Louis David, Leonidas at Thermopylae (1814), via Wikipedia.